Spectrograms make speech visible and are one of the most popular displays used by phoneticians, speech scientists, clinicians, and dialectologists. A spectrogram is a readout that shows frequency on the vertical axis, time on the horizontal axis, and amplitude (amount of sound energy) as either darkness or coloration. See the following figure. Bandwidth: Original method used to track formants on a spectrogram. Now usually replaced by a fast fourier transform (FFT) and linear predictive coding (LPC). Burst: Acoustic event caused by the sudden release of airflow from a stop consonant. Looks like a thin vertical spike on a spectrogram. Frication: Turbulent airflow marking the presence of fricatives (such as /s/ and /ʃ/) or affricates (such as /ʧ/ and /ʤ/). Shows up on spectrogram as darkness spread across a wide frequency section. Formant frequencies: Important acoustic cues for vowel quality resulting from vocal tract resonance. They show up on the spectrogram as dark bands running roughly horizontal with the bottom of the page. Formant frequency transition: Region of rapid formant movement or change important for identifying consonants, particularly stops and affricates. Locus: Frequency regions that help identify place of articulation in stop consonants. For example, second formant frequency (F2) transitions starting at relatively low frequencies (and then rising) are likely bilabial. 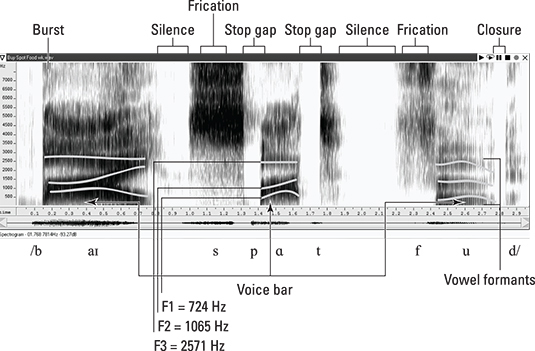 Stop gap: A silent region on a spectrogram (which shows up as blank) that helps distinguish the presence of a stop consonant. Voice bar: Dark band running parallel to the very bottom of the spectrogram indicating energy associated with voicing.